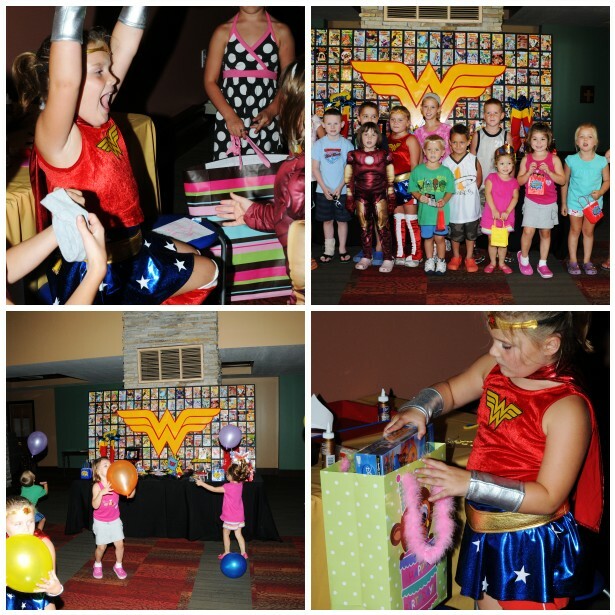 So fun…looks like she enjoyed every minute of the party! The whole party looks amazing! And the "SHELBY" centerpiece is fantastic – great job!! AMAZING! I love this party. I can relate to running around in wonder woman undroos as a kid. I also had a wonder woman sleeping bag. What a great party and so great to see Erin's photos! I LOVE this party and Shelby's reaction was the sweetest!!! Seriously, I want this party for my birthday! I love Wonder Woman!!! You did an amazing job Jamee! SO CUTE! What a great theme! That's so cute! I love the old school Boom! and Splat! bubbles! This is incredible! 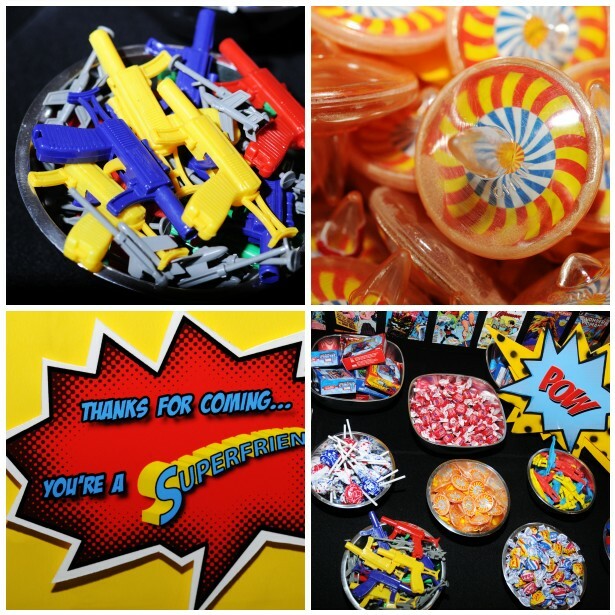 I love the comic book cover backdrop and placemats especially! This is an amazing party, I love all the incredible details! uhm….speachless! I have been a huge WW fan since well, forever! I have no fewer than 5 different WW costumes, yes I dress as WW every year for halloween (and sometimes comiccon…im a nerd…) I LOVE this party so much it actually hurts a little bit and brings a tear to the eye! to say that it is amazing seems inadequate…thanks for sharing! would LOVE more info on how the backdrop was constructed, were they actual comics? how was it all held together? 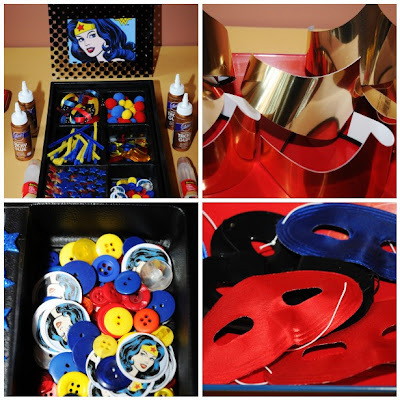 and what material is the WW logo made of? Girlfriend, you are proving time and time again how awesome your parties are! How did I never comment on this party before??? I wanted to be Wonder Woman (still trying :-)), so of course, I love everything about this. Love the placemats–I tried to do the same thing for a Superhero family b-day dinner, but far less spectacular. Love the golden lassos! So many great details! So love this idea!!! I was Wonder Woman for Halloween when I was in second grade. My brother were Batman and Robin. Their costumes came with capes so my mom made me a cape from leftover material she had (it was brown). We were so cool! My friend just told me that she has never had a birthday party. She is the sister that my husband would have liked his sisters to be. She is our Wonder Woman, she deserves this kind of party. We are going to try to pull it off in Las Vegas with all of her co-workers/ family. Thanks for putting your creativity out wear we can see it. Do you ahve a shop to buy like the placemats and some of the printables? Where are the place mats from? Thanks! WOW!!! This party is amazing! I love every detail and her reactions are so cute! BEAUTIFUL!!!! Thanks for sharing. I absolutely need those printables and backdrop. How did you make them or where did you get them…please share.. I LOVEEEE this wow I'm in shock of how hot this came out can you please post where you got the place mats ,ww glasses and stuff from thanks so much. What a great mom you are – what great memories you are making for your daughter! 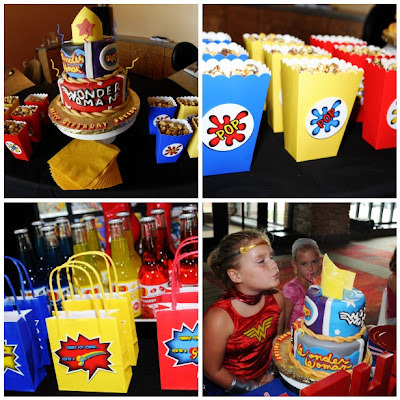 I am planning a superhero Photo Booth for my daughter's promotion party – would love info on the caption placemats – my email is lkamiab@yahoo.com – thanks! WHERE DID YOU GET THE PLACE MATS? Hi! Where did u get the placemats?? Brilliant wonder woman party. All arrangements are superb and I also hosted a fun spa themed party at some domestic New York venues for my best friend’s birthday celebrations. It was a fabulous surprise bash and we had blasting time together.